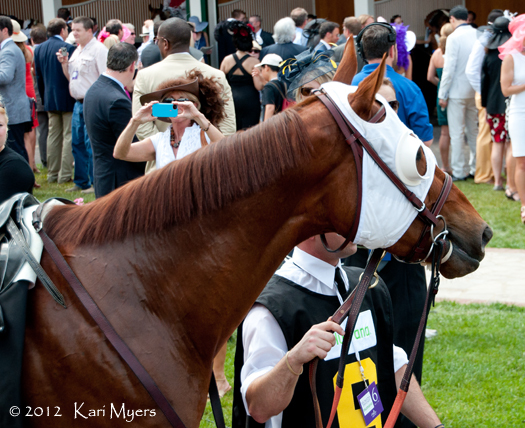 May 5, 2012: Groupie Doll in the paddock at Churchill Downs. Good luck to one of my favorite mares, Groupie Doll, who is running at Keeneland on Saturday in the Grade 2 Thoroughbred Club of America Stakes. I fell in love with her two years ago, and was so happy to see her blossom into a fantastic sprinter. She was Champion Female Sprinter last year after a campaign that saw her win five graded stakes in a row, including the Breeders’ Cup Filly and Mare Sprint. She ended her run last year with a nose defeat to Stay Thirsty in the Grade 1 Cigar Mile against the boys. The photos shown here are from Kentucky Derby day in May 2012, just before her track record win in the Grade 1 Humana Distaff against the previous year’s Champion Female Sprinter, Musical Romance. After Saturday’s race at Keeneland, Groupie Doll will make her final start for trainer and co-owner Buff Bradley in defense of her title in the Breeders’ Cup Filly and Mare Sprint at Santa Anita in November. Here’s to Mr. Bradley and his team, who’ve kept her healthy and happy for years! 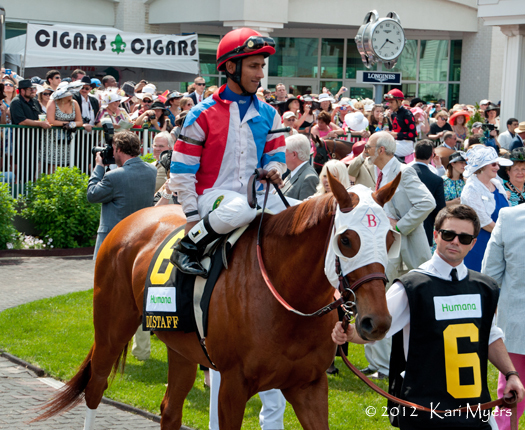 May 5, 2012: Rajiv Maragh and Groupie Doll head out of the paddock to set a new track record in the Humana Distaff. 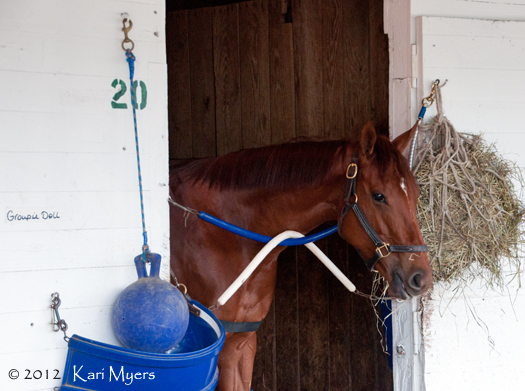 May 3, 2012: Groupie Doll in her stall a few days before her track record win in the Grade 1 Humana Distaff. This unassuming chestnut is Groupie Doll, a homebred filly for the Bradleys by Bowman’s Band out of the Silver Deputy mare Deputy Doll. All she’s done this year is win almost $1.4 million while hitting the board in all of her 9 starts, including a streak of wins in three Grade 1 and two Grade 2 races. She ran against the boys twice, coming in second to Boys at Tosconova in her first start of the year and placing second by a head to Stay Thirsty in her last start of the year, the Grade 1 Cigar Mile. Her other starts were against the likes of Royal Delta and Awesome Maria. She’s kept amazing company all year long! She won the Breeders’ Cup Filly & Mare Sprint over a deep field, set a new 7 furlong track record at Churchill Downs in the Humana, and won Grade 1 races over both Polytrack and dirt. She has sewn up the Eclipse for Female Sprinter, and will probably get some votes for Older Female, too. Buff Bradley has done such a fantastic job with her, and it’s even more special to know that she’s getting a rest at the family farm while being turned out with the other Bradley hero, Brass Hat! Racing couldn’t ask for a better story this year, and we’ll get to hear more next year. They’re going to keep her in training as a 5 year old. I can’t wait!